The answer to learning how to create a well equipped kitchen on a budget starts with forming a list of items that you will need, while at the same time keeping costs down. In this list, the only items added will be those that you simply can’t do without. There is no need to stock the kitchen up with one of everything, you think you might need. Remember you can always add more cooking products and utensils as and when you discover what habitual cooking preferences you actually have. This will lead to a gradual build up of equipment and avoid you buying items you will never even use. While you may be thinking that a food processor might be worth considering, ask yourself is it really essential? If so choose one of the less expensive ones, even a hand cranked food processor might be enough to get you started. This would free up more of your cash to buy other appliances that may be more beneficial and provide more value for money. Things like a 4 slice toaster for example which is something that is used on a daily basis in most homes. Even a mixer or blender might be better options as they perform particular functions. These functions could be exactly those that you find yourself using more frequently. Plus you won’t have the same set-up situation involved with food processors. Yes the time may come when this item will be added to your list of kitchen appliances but until then hold off as your money could be better spent on the more useful, less costly ones. Without these items, you would be struggling to cook up a meal if not added to your list. 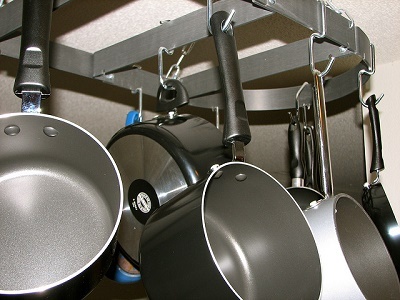 They are the mainstay cooking equipment of any well equipped kitchen. The pots and pans we use today are the results of improvements in the design as well as the materials used to make them learned over many centuries. They have become more efficient in many aspects of cooking. To start with you could probably limit yourself to buying a big pot to use when making soups. This would also double up when the need arises to cook large amounts of potatoes, cabbage and stews etc. Which will come in handy when entertaining groups of friends or family. That and a medium or small pot would get you by. Generally you would buy these two sizes included in a graduated set. That would certainly work out cheaper when buying the complete set. Although if you wanted to have the better more expensive sets, you could investigate the possibility of building them up as separates. Also stock up with a range of good pans that used to sauté and fry foods. The same applies here as with the pot sets above. Look for separates, or if you can afford it buy the set of graduated sizes used for different purposes. Don’t forget a couple of roasting pans. A small one would take care of the smaller meat and poultry cuts, while a larger version will be required for those larger items. Turkey and large joints of meat are just two situations where the large size will be required. Others will definitely crop up, so add both sizes to your list as you will use them. There are no better memories I have, than that of my mother cooking dinner for us and the smell of fresh baking greeting us on arriving home from school. To ensure you recreate those same memories for your kids, add some non-stick ceramic baking dishes, some cookie sheets and a selection of cake pans to your baking dishes itinerary. 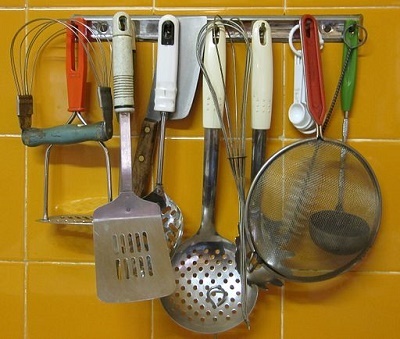 Here are a list of utensils you will definitely need if you want to be able to cook properly. Imagine you want to add a pile of ingredients together for mixing, such as flour, milk and eggs, what will you need? Correct, a mixing bowl, a spoon and a measuring jug to ensure you have the proper mixture. Kitchen scales are inexpensive these days as is a whisk suitable for those more watery mixes. A selection of bowl sizes and mixing spoons will help greatly with the variety of mixes you will be performing. Add to these, ladles, a grater and a can opener for good measure. Complete your list with a colander to rinse things through, a potato mash and a veggie peeler. Non-metallic spatulas that won’t destroy the finishes on your pans and a good class knife set wouldn’t go amiss. Take a look at kitchen equipment that Amazon have to offer. The list above should be enough to get you started and keep you contented for a good period before you start thinking about expanding. 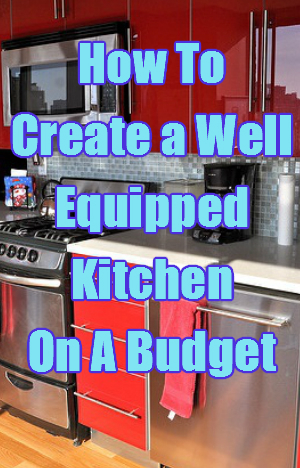 You will still have a well equipped kitchen while at the same time sticking to your budget. By envisioning each cooking scenario you will realize that many of the items on your list will complete many other tasks.